I approached this book warily, fearing it might ooze treacly sentiment. No fear! The writers of these essays have captured the heart of the mother-daughter bond in all its complexity. The relationships these authors describe run the gamut: loving, distant, respectful, oppositional, tender, regretful – and sometimes in combination. A perfect gift for your mother, sister, aunt, close friend . . . or yourself. In What My Mother Gave Me, women look at the relationships between mothers and daughters through a new lens: a daughter’s story of a gift from her mother that has touched her to the bone and served as a model, a metaphor, or a touchstone in her own life. The contributors of these thirty-one original pieces include Pulitzer Prize winners, perennial bestselling novelists, and celebrated broadcast journalists. Whether a gift was meant to keep a daughter warm, put a roof over her head, instruct her in the ways of womanhood, encourage her talents, or just remind her of a mother’s love, each story gets to the heart of a relationship. Rita Dove remembers the box of nail polish that inspired her to paint her nails in the wild stripes and polka dots she wears to this day. Lisa See writes about the gift of writing from her mother, Carolyn See. Cecilia Muñoz remembers both the wok her mother gave her and a lifetime of home-cooked family meals. Judith Hillman Paterson revisits the year of sobriety her mother bequeathed to her when Paterson was nine, the year before her mother died of alcoholism. Abigail Pogrebin writes about her middle-aged bat mitzvah, for which her mother provided flowers after a lifetime of guilt for skipping her daughter’s religious education. Margo Jefferson writes about her mother’s gold dress from the posh department store where they could finally shop as black women. Collectively, the pieces have a force that feels as elemental as the tides: outpourings of lightness and darkness; joy and grief; mother love and daughter love; mother love and daughter rage. In these stirring words we find that every gift, ?no matter how modest, tells the story of a powerful bond. 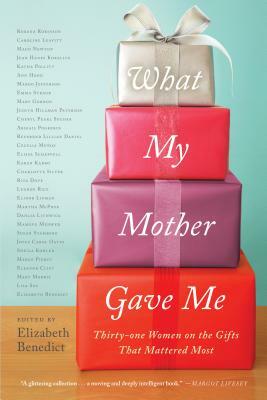 As Elizabeth Benedict points out in her introduction, “whether we are mothers, daughters, aunts, sisters, or cherished friends, we may not know for quite some time which presents will matter the most." Elizabeth Benedict is a graduate of Barnard College and the author of five novels, including the bestseller Almost and the National Book Award finalist Slow Dancing. She is the editor of the anthologies What My Mother Gave Me, a New York Times bestseller, and Mentors, Muses & Monsters, and has written for the New York Times, the Boston Globe, the Los Angeles Times, Esquire, and the Huffington Post, the Rumpus, and Tin House. Two of her essays have been selected for Best American Essays collections. She has taught widely and works as a writing coach and editor.